Spring has sprung, allegedly. I woke up to the shock of several inches of out-of-the-blue snowfall yesterday. But that’s spring in Michigan! All in all, the daily temperatures are on the general upswing, and it’s time to start eating lighter (green peas and asparagus and mint and fresh greens, yum . . .). But before I can do that, I need to use up all of my winter reserves – that butternut squash in my fridge, those sweet potatoes in my cupboard, that canned pumpkin I bought back in the fall. 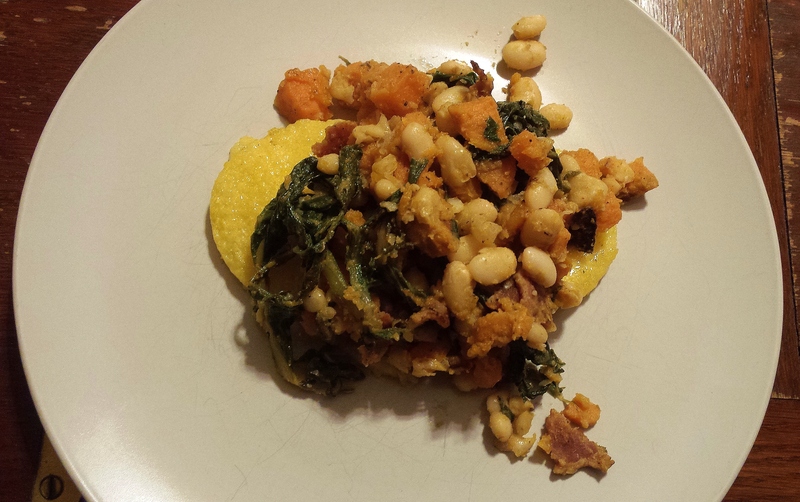 And in these chilly throes of early spring, rich comfort dishes such as this polenta with sweet-potato white-bean bacon ragout still feel appropriate. -Heat in food is one of my favorite things ever, as you may have noticed by my frequent use of cayenne pepper and red pepper flakes in my recipes. If you’re not into spicy foods, feel free to omit the cayenne pepper and add a little more oregano and black pepper to make up for it. -If you are using dried cannellini beans, you will need to soak them overnight. Place them in a bowl covered with several inches of water. Then drain and rinse the beans. To cook, bring them to a boil in a large pot holding enough water to cover them, then reduce heat and let simmer for one hour before draining and using in the recipe. Preheat oven to 400 degrees. Place cubed sweet potatos in a metal backing dish and drizzle with two teaspoons of oil. Bake for 20-30 minutes, until the sweet potato pieces are soft. Lay four slices of bacon in a large frying pan and cook over medium-high heat, about three minutes on each side, until it’s crispy. Once there, and to ensure it doesn’t burn, transfer quickly out of the pan onto a plate covered with two layers of paper towel. Remove the pan from heat with the bacon grease reserved in it. In a large pot over medium heat, add the garlic and one tablespoon of cooking oil. Let cook for a minute, then add swiss chard and cook for four to five minutes, until well-wilted. While the swiss chard is cooking, and after the sweet potatoes are out of the oven, transfer them to the frying pan with the bacon grease and saute for a minute or two on medium heat. Then spoon them out and add them to the pot with the swiss chard. Add the chicken stock, drained cannellini beans, oregano, black pepper, salt, and cayenne pepper; crumble the bacon into the pan; and mix well. Reduce heat to low, stirring every few minutes until the polenta is done (the next step). Cut polenta into one-fourth- to one-half-inch slices depending on your desired thickness. Place slices into a large frying pan coated with the remaining tablespoon of oil and fry over medium heat, cooking until polenta is cooked through and lightly browned, about seven minutes on each side. Once done, add a few pieces of the cooked polenta to each plate and top with generous scoops of the ragout. Makes four to five servings.